This is because emotional reactions are considered weak, while passion* is strong. It’s a false distinction, of course. What one person calls passionate another might call emotional. It depends on whether the action appears rational or not. 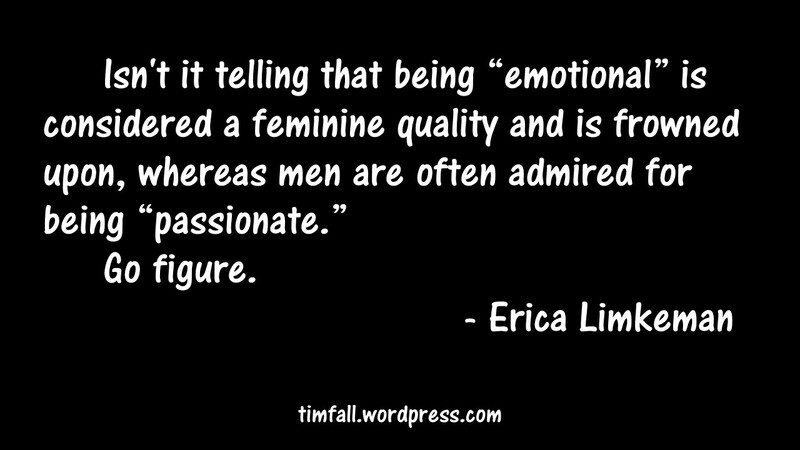 And when it comes to being emotional or rational, there are plenty of examples of women and men displaying either. In 1 Samuel 25 David had not yet been crowned king over all of Israel as King Saul (David’s master) still reigned. David had been anointed as Saul’s successor but he and his men lived as wanderers. From time to time they needed new supplies. Nabal was a rich farmer with vast flocks, herds and fields. David sent his men to Nabal, pointing out that they had kept watch over his lands to keep them safe from marauders. Nabal refused them any aid. Abigail, Nabal’s wife, saw disaster approaching. Abigail acted quickly. She took two hundred loaves of bread, two skins of wine, five dressed sheep, five seahs of roasted grain, a hundred cakes of raisins and two hundred cakes of pressed figs, and loaded them on donkeys. Then she told her servants, “Go on ahead; I’ll follow you.” But she did not tell her husband Nabal. Abigail told David that her husband was a fool and not worth killing, and that he should accept the supplies she brought rather than carry out his plan for revenge. David agreed. This story is a fascinating tale, and all the more so for the role reversals. Take a look at the two main characters. Who let emotions dictate action? David. Who acted rationally? Abigail. In this whole event, Nabal’s a fool, David is ruled by anger and feeling unappreciated, and Abigail keeps her head and saves the day. Anyone who says women are supposed to be emotional while men get to be rational is not only wrong; they deny the Bible itself. Emotions and clear thinking are found in both women and men. That’s the way God made us. *Passion itself can be problematic. See The Perils of Passionate Speech. **If Nabal had male relatives, they might have laid claim to the estate. Whether David would honor that claim is another matter, seeing as how he felt justified to destroy it all when Nabal was still alive. This entry was posted in Uncategorized and tagged Abigail, emotions, Erica Limkeman, King David, Nabal, rationality, women and men. Bookmark the permalink. Really good points and example, Tim. Unfortunately I think a lot of the time, whatever characteristic is associated (rightly or wrongly) with women is seen as lesser. Women are supposedly “more nurturing”–so nurturing tasks are unpaid or low-paid. I don’t mean to imply that the only way to value something is in financial terms; I just think it says a lot about what we prioritize and the often unfair stereotypes and dichotomies we set up. That’s an interesting way to analyze it, Jeannie. everyone agrees nurturing is good, but if we say it’s women’s work then we get to value it less in practical terms: less pay. What a twisted way to live. With 15 – 20 feet of are people who will show the good and not so good of emotions. What was a good response no will not be correct later. Sensitivity – too sensitive or insensitive; decison making, decisive or cruel. Too many variables, yet we know who will help us all be better. I’m not sure what you’re getting at, PB. Enough typos corrected by spell check I am lost too. Within 15 – 20 feet of us are people who will show the good and not so good of emotions. What was a good response now might not be correct later. Sensitivity – too sensitive or insensitive; decision making, decisive or cruel. Too many variables, yet we know WHO will help us all to be better. A comment on the general human condition, and the reliance on HE who provide guidance. I have seen rational women and irrational men. I have seen women act with wisdom while men acted on emotion. Sadly, I have seen the results of bad decisions -and yes, we all have. Mine is from the counseling perspective as well. This ‘men aren’t emotional’ thing is one of my pet peeves. Anger is an emotion. Also the Abigail story makes me think of something else. Risk avoidance is all about being rational, imo. So when you ask women to protect themselves by avoiding risk you are saying be rational (avoid that dark alley) not emotional (I should be able to go wherever I wish). Abigail was being rational and dealing with David, to avoid danger. Women do this literally all the time. The passage even says David praised her good judgment. He knew which of them was thinking rationally. Wow, you nailed that, Lea. I would add that I believe it’s rational in a more long-term sense for women to insist they get to go everywhere men go as safely as men do–it’s not a battle we can ever stop fighting without gradually losing more and more access to public spaces and anyplace outside our homes. But in a short-term sense, it’s totally rational to abide by predators’ policing of public spaces to control women’s movements in order to not be attacked. Abigail: One of my all-time favorite women. Good stuff Tim! How is it then that some Evangelicals tell us that certain roles are ordained by the Almighty, cast in concrete, and based solely on plumbing received at birth? Come on guys. Seriously? It isn’t “some evangelicals” that imply that; it’s the Bible. No it’s not. Read my posts on women and men for a full explanation. Tim, with all due respect, I have, but regardless of what we come up with to rationalize away gender roles as they’re clearly portrayed in Scripture, none of it negates what God has really said. We mustn’t be the Eves, questioning God when we ought to take Him at His word. I don’t question God or his word. I read it all and as a whole. Also Eve did no more than Adam since he was right there with her when Satan spoke to them in the Garden. P.S. The phrase “with all due respect” isn’t necessary. A comment is either respectful or its not. Funny you should mention Adam being with Eve and that they’re equally held responsible since that’s where Paul backs up his allegedly sexist claims, stating that “Adam was formed first, then Eve. And Adam was not the one deceived; it was the woman…” (1 Tim 2:13-14). I’m at a loss as to how duped we’ve become on this issue as the church. The obvious teaching in the Bible, as a whole, is being overlooked all in the name of an equality that God never says we don’t already have in Him; it’s those pesky gender roles that we can’t seem to reconcile as He does so beautifully. Paul was writing to a pastor in a city with a creation myth based on the superiority and primacy of women. His instructions have to be read in context, just like all of Scripture. You lost me there. Creation myth what? Context is key, I completely agree. So what do we do with the rest of the Scripture that maintains gender roles and responsibilities? Contextually kick that to the curb, as well, because it doesn’t support the equal rights of both genders? Sometimes it’s wiser to just accept what the Bible says at face value (especially as a whole) and work within those boundaries that He gave us for our own good and for His glory. What do you do with the passages that show women leading God’s people? It’s ok, bibliolotor, we don’t need to agree or convince one another. But as for the context in Ephesus, it’s worth reading up on in order to get Paul’s context. The same thing that you’re suggesting I do with Paul, read them contextually. We can agree to disagree, for sure. Thanks for engaging. The ‘obvious’ teaching here is that Adam was sinning willingly and not at all confused. That’s not a good thing. Bibliolator, this comment sounds like you are trying to win an argument rather than engage in discussion. I will delete it in a moment. BB, Gender roles “clearly portrayed in Scripture”? You mean like David listening to and accepting Abigail’s inspired and faith-filled prophecy (recorded in 1 Samuel 25:28-31)? Or like Abigail going expressly against her husband’s wishes and being commended for it (1 Sam. 25:32-33)? 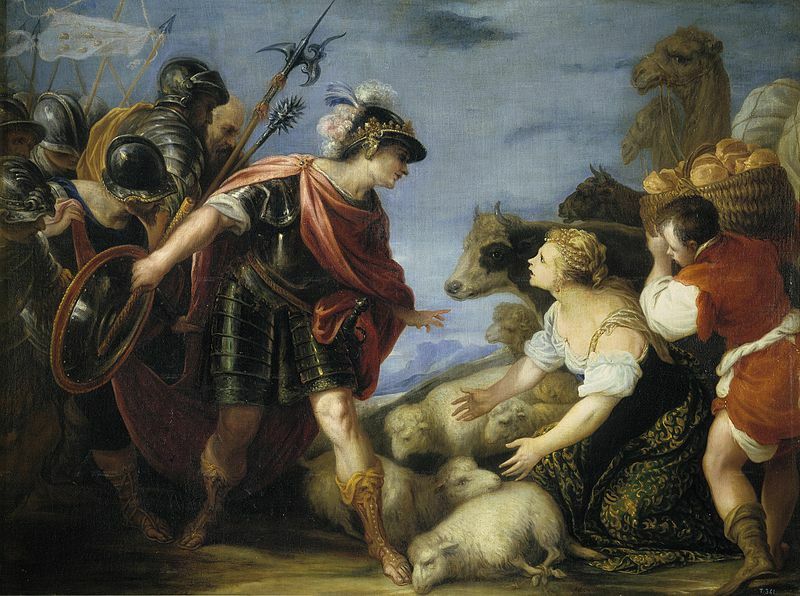 Or, Abigail bravely (and diplomatically) meeting David who had 400 insulted men, each with a sword and intent on revenge? Or, Abigail being the one the servants go to for help and rescue? As much as I’d love to engage, Marg, I’ve been deemed argumentative by Mr. Tim and my last reply to Lea deleted. Some men do have a greater propensity to foolishness 😉 I’ll look up the Scriptures you noted and the link, so if you’d like to continue discourse elsewhere, message me on my Facebook page. Godspeed! I appreciate reading this comment because it makes me realize I don’t want to be someone who just shows up acting like they have it all figured out in advance. Thanks for the example and reminder! It’s certainly worth thinking on.